It seemed so far away when, in June last year, Apple announced their two-year transition to Intel architectures; it also didn't exactly add up. At their World Wide Developer Conference, Apple let the world know that every version of Mac OS X since 10.0 has been compiled and running on x86 hardware, so the OS was ready. Apple's iLife and iWork suites are a great supporting cast to the OS, and those applications were either ready or very close to being ready. Yet, Apple was telling everyone that they would start the transition by June of 2006 and be done with it a year later. 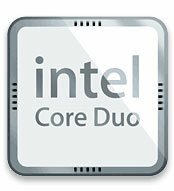 Everything started to make sense once Intel's Core Duo launch was scheduled for the beginning of the new year. It was this chip with which Apple would launch, and why not, as it has a guaranteed migration path over the next year. Core Duo platforms will eventually be able to be migrated to Merom based offerings (the two chips are pin-compatible) and using Core Duo on the desktop can tide users over until Conroe arrives if necessary. This way, Apple doesn't have to worry about switching to the Pentium 4 and its high clock speeds and then over to Conroe with its lower clock speeds, explaining why one is superior to the other each step of the way. Apple gets a quick and easy migration to an architecture that today offers similar clock speeds to their G5 processors (at least at the low end and mid-range), and they get to boost clock speed and performance later this year with Conroe and Merom. When Apple announced at this year's Macworld San Francisco that they were ahead of schedule with the move, it was most likely more of a nice spin to put on things than truly being ahead of schedule. The MacBook Pro and the Intel based iMac both rely on Apple's existing product designs, and the software has been ready for months now. Third party support is lacking, and Apple's Pro applications have yet to be ported over, but if anything, it wasn't that Apple was ahead of schedule, they were simply waiting on Intel. It's probably better etiquette to say that you are ahead of schedule rather than saying that you are waiting on your brand new, larger-than-life CPU partner to deliver their goods though, isn't it? Now that Intel's Core Duo has finally been launched, Apple could go ahead with their PowerPC to x86 transition, but there's another problem. A very smart man at Intel once told me that you should never launch a new microarchitecture alongside a new manufacturing process. With so many variables, things are bound to go wrong, making delays inevitable. With the Core Duo, Intel not only introduced a reasonably sized change in microarchitecture, they also made the shift to 65nm on this semi-new architecture. The end result seems to be that availability of Core Duo processors and chipsets just isn't all that great. In fact, unless you are a Tier 1 OEM or ODM, we're hearing that you aren't getting Core Duo chips until sometime next quarter! That's getting dangerously close to the launch of Conroe and Merom, making Core Duo seem very much like a temporary solution. With limited supplies, all of Intel's partners were limited in what they could bring to market based on Core Duo, and when. That's why one of Intel's strongest partners, Dell, made their first Core Duo product a higher priced 17" model that would sell in lower quantities than a lower priced mainstream solution. And it's also a big reason why Apple's first Intel based products are what they are, and why we are also not finding the Core Duo in a revamped $400 Mac mini today. Curiously enough, Apple was able to secure large enough quantities of Core Duo to stick in their iMacs before any PC vendor was shipping them in a notebook. So, Apple's quantities are really small enough that they could operate well within Intel's capacity at this point, or Intel gave them some preferential treatment - potentially as a house warming gift to commemorate the new relationship. Then there's the issue of third party software support; the problem is that in the grand scheme of things, Apple is still small fish in the computer industry, and thus, their partners like Adobe and Microsoft are still not ready with their Universal Binaries; although, the transition was announced over six months ago. So, today's Intel based Macs have to rely on slow binary translation for full software compatibility. The other problem is that even smaller partners like Aspyr aren't quite ready yet either, so we can't really answer questions like whether or not the port to PowerPC was the reason that Doom 3 was so slow on OS X yet. While it's easy to argue that Apple had always planned to have Intel based Macs out as soon as Intel launched Core Duo, it's really tough to say that the transition is ahead of schedule if major software support isn't there (even some of Apple's own applications won't get support until March). These first-generation Intel-based Macs are more like public beta tests rather than final platforms; while the hardware may be complete, as you will soon see, relying on binary translation to run any non-Universal applications isn't the most pleasant thing in the world. However, Apple isn't forcing the new platforms on their customers, as you still have the choice to purchase the PowerPC G4/G5 based systems at the same price if you desire. The new Intel based Macs are selling though, despite the early stage of the transition. And they are selling to whom you would expect: the early adopters, the Mac enthusiasts, those who need a computer today and won't upgrade for a very long time...oh, and of course, some may find their way into my hands. Turning off one core leaves the full 2MB of cache for the other core to use since it is a shared L2. P.S. I have read elsewhere that the new iMac Core Duo uses less than half of the CPU's processing power to play back H.264 Hi-Def 1920x1080 video at a full 24 fps. If true, that's great, because my iMac 2.0 chokes on that. It plays back relatively smoothly, but only at about 12-15 fps. That bodes well for a future single-core Yonah Mac mini. Max CPU utilization (across both CPUs) when playing a 1080p stream scaled to fit the screen is about 60%, but it usually hovers below 50%. I am not sure whether or not the X1600's H.264 decode acceleration is taken advantage of (I doubt it), I'm trying to find out now. Also remember that on the PC side, the X1600 will only accelerate up to 720p. I just confirmed with ATI, the X1600's H.264 decode acceleration is currently not supported under OS X. ATI is working with Apple on trying to get the support built in, but currently it isn't there. You could think about it that way - but in the end, the buyer is interested on the total energy consumption/heat production (as this is what he pays for, and what he must get rid of). Have you heard of the Toyota D4D engine? It has a record of 2.4 liter (less than a gallon) diesel fuel used per a hundred kilometers (60 miles). However, the same engine on a Land Cruiser 4x4 all options will get you much less (four times less maybe). I was under the impression that Intel was blaming Microsoft for that, so that would not apply to OSX, though if the driver works perfectly for every platform except Napa I'd guess its a hardware problem that MS will fix in software (which is well enough as long as it works). The power consumption difference is probably less than 10W anyway. It matters on a notebook but hardly matters with a desktop.